The Copy and Paste Project: Thank You! We haven't been around much lately. We know. Between us here's been a whole host of things tugging at our sleeves and keeping us away from here. But whether it's been the opening of etsy shops; the hosting of handmade-gift parties; the debuting at craft-fairs; the writing of magazine articles or the general distractions of the day job ... we've not forgotten our Copy+Paste plans. In between all of this we've been squirrelling away ideas and notes for what we want to do together .. and with you all ... next year, including the spring class we're hugely excited about. Until then we just wanted to thank you for your support this year. We are grateful for your time, loyalty, interest, friendship and inspiration. Merry Christmas girls and a Happy New Year! Missed you! hope your Christmas was merry and bright! 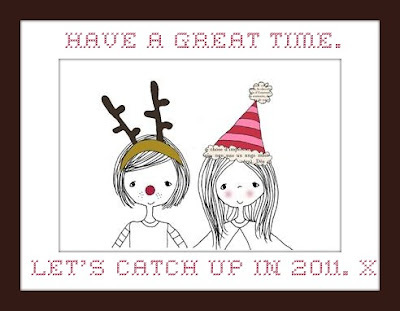 cheers to 2011. Being creative and original doesn't always have to begin with re-invented wheels, clean slates and blank pages. *COPY*: There's a world of perfectly ingenious mind-stirring quotations, lyrics, conversations, designs, photographs, bits, pieces and miscellaneous bobs out there ... and we like to find them and share them with you. *PASTE*: Sometimes we take from these 'found' gems and make something satisfyingly new from paper, paint, pixels, fineliners, fabric, fluff, glue, crayon, words ... mime ... OK, maybe not mime. And sometimes we just look at them and take in their fabulousness. We'd love it if you picked up your creative-tool-of-choice and do some copying and pasting alongside us, and we'd be jsut as happy if you dropped by to read and look at the work of some great artists and creative people. We'd be happier still if you'd bring a friend with you... and some refreshments. 26. We've Been Copying: What is England? 22. Miss Cay's Recipe for Blueberry Boy Bait! This is a Flickr badge showing public items from the The Copy + Paste Project group pool. Make your own badge here.